I have a freebie sock design completed, photographed and laid out, and being test knit as we speak. A second design has been drafted and test knitters are all lined up! A few more designs are spinning about in my head and will have to wait just a little longer. While all this is ongoing, most regular knitting has been suspended with the exception of my indigodragonfly No Purl Monkeys. These things really just knit themselves! I am actually ready to start the heel flap on Sock #2 and plan to have these done soon so they will be ready for when the weather turns. Until today’s 30 degree high, there are many that might have argued that had already happened, but I digress. I have also done little to no spinning. That has to be remedied soon so as not to lose the consistency I have gained. Plus I really miss the soothing, zen feeling that it brings. What have you been doing now that autumn is just around the corner? 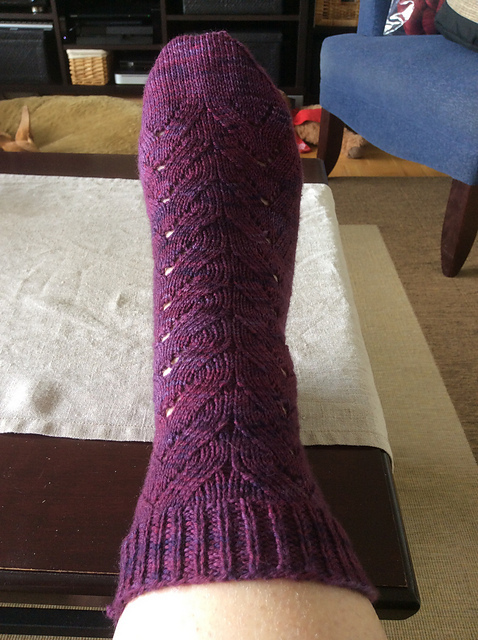 This entry was posted in Uncategorized and tagged design, indigodragonfly, monkey, socks by Rayna. Bookmark the permalink. Are you going to post up your sock design here when it’s ready? I’d like to see it! Things are getting pretty cool here too, need to get my needles clicking a bit faster. You bet I will! The freebie is planned as part of a re-branding/re-launch (thank you Shireen at The Blue Brick!) and then the pattern that’s being test knit now will actually be my first paid pattern. I am very excited about it!